Obverse: Wreath motif with outward-facing leaves, three parallel cabled lines and hidden smiling face. Reverse: Disjointed Celtic horse left with long neck, pellets above right, 'crab' between legs and pellets below, standing on cabled exergual line. 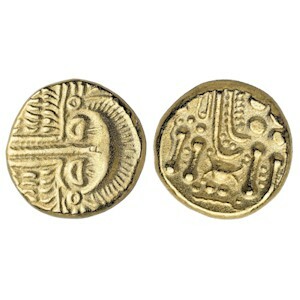 History: Cheriton, Hampshire is where the coin was found and it is believed to have been made by the Belgae tribe who made their way across the English Channel into southern Britain from Gaul. Caesar tells us that they first crossed as raiders, only later settling on the island.